SAP is both a company and a family of products in the Enterprise Resource Processing family. The acronym originally stood for “Systems, Applications and Products”. Founded in 1972, SAP has grown to be the largest business management software company in the world and has published software suites aimed at every level of business from Fortune 500 to startups. With US headquarters in the Newtown Square suburb of Philadelphia, SAP is licensed, implemented and supported by a large family of certified business partners around the world. Try our live demo right now! SAP created SAP Business One to specifically address the Small to Mid-sized Business marketplace (sometimes referred to as SMB). It is a product unto itself and not a scaled down version of the well- known R3 or Enterprise Suite favored by Fortune 500 accounts. While initially available only on a MS SQL platform, SAP now offers Business One on the very successful SAP HANA “in memory” processing platform as well. SAP Business One is a full ERP (Enterprise Resource Planning) system which includes all modules needed to build, sell, ship and account for products. Aimed initially at wholesale distributors and discrete manufacturers SAP has now partnered with other specialized developers to deliver extended versions of SAP Business One for service industries, process manufacturers, job shops and other vertical markets. Reporting is facilitated by the industry leading Crystal Reports, also an SAP product. 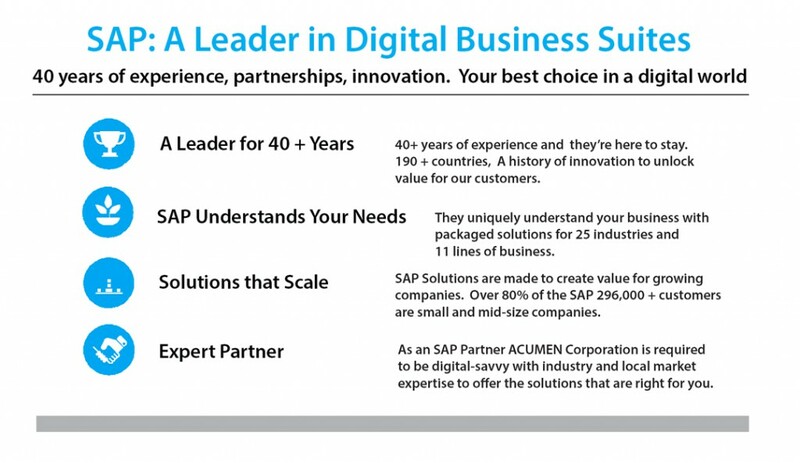 SAP licenses SAP Business One through, and implementations are managed by, certified business partners like ACUMEN Corporation located in strategic areas around the world. Currently over 50,000 businesses business around the globe have implemented SAP Business One. Would you like to know how to begin implementing? Click here for our pricing and options!